* Your confidence in our pricing is very important. That�s why we offer the following guarantee. We guarantee that the total cost we charge for a �whole-house� order of our products and services will be less than you would pay for comparable products and services, subject to the following definitions and restrictions. Whole-house Order. A �whole-house� order is defined as any order for all products and services for a single residential structure that could be provided by The Hardwood Company. 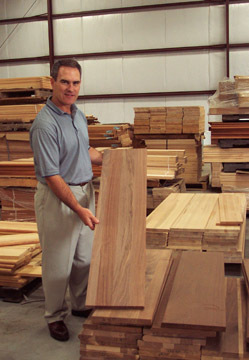 For example, The Hardwood Company sells windows, floors, doors, and millwork. If you are purchasing any or all of those products for a house, and the quality of those products is very similar or equal to the quality of the products we offer, then those products collectively are known as a �whole-house� order. Restrictions. This guarantee does not apply to less than �whole-house� orders. For example, if you purchase windows and doors from The Hardwood Company, but you purchase floors and millwork from one or more of our competitors, and those products could have been purchased from The Hardwood Company, then this guarantee shall not apply. Similarly, if you purchase some windows from The Hardwood Company, but you purchase other windows (which could have been purchased from The Hardwood Company) from one or more of our competitors, then this guarantee shall not apply. This offer does not apply to items that represent a competitor�s inventory which is not available for immediate sale, is of limited quantity, is damaged, used or liquidation/close-out merchandise. Applicable sales taxes will be excluded in price comparisons. Time Frame. This guarantee applies if you provide, at the time of order, valid proof of a competitor�s, or a group of competitors�, offer to provide a �whole-house� order at a total cost less than that offered by The Hardwood Company. Competitors� offers which are intended to be compared with offers from The Hardwood Company must be provided in writing, and a period of five (5) business days must be allowed to complete the comparison. Quality Comparisons. We pledge to compare the quality of all products in good faith based on commonly accepted opinions of the quality of the building products being compared. However, comparisons of exclusive brands of The Hardwood Company with exclusive brands of competitors is subjective, and determinations made by The Hardwood Company are final. Eligible Price Adjustment. If we determine that you have received a legitimate �whole-house� offer at a total price lower than our offer, then we will lower our price to the same price offered by our competitor's, minus $1. Thus, we guarantee a lower price on every �whole-house� order. We will not match competitors' prices that result from a price match; that is, we will not participate in a �cycle� of continued price matching on the same order. highly competitive pricing at all times!